Dedicated to the “Lord of Knowledge” i.e. Lord Ganesha and belonging to the “Ashtavinayaka” pilgrimage circuit is a Hindu shrine in Maharashtra called Siddhivinayak Temple of Sidhatek. This “Ganpati” temple is situated in the Ahmednagar district on the bank (northern) of the River Bhima at a distance of 1 km from the Sidhatek village. 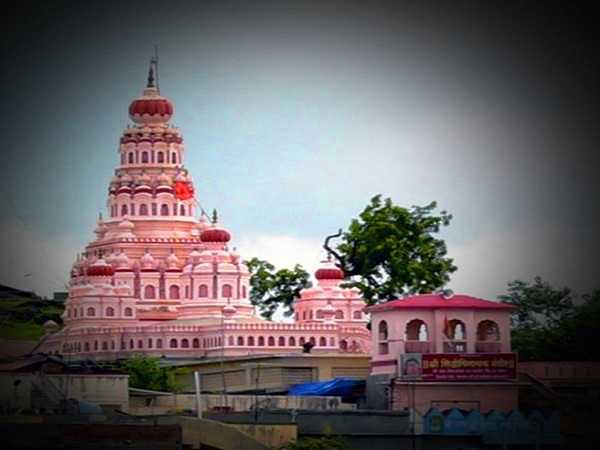 Situated on a hill, this temple is surrounded by beautiful Babul trees. In addition, this temple is renowned for a ritual known as “Pradakshina” wherein devotees in order to appease Lord Ganesh undertake circumambulation of the hill about seven times. The ideal time to visit this temple is during the winter season which begins in October and ends in February when the climate is extremely pleasant with the minimum temperature dropping to about 22 degree Celsius. The nearest station to this temple is located in Ahmednagar. The Ahmednagar Railway Station is well connected to major cities in the country such as Pune, Manmad, Dhaund, Goa, Nashik etc. There are two routes from Kolhapur to this temple, and they are via NH48, via NH48, and via NH48 and Khanapur. There are three routes from Mumbai to this temple, and they are via Bangalore-Mumbai Highway/Mumbai Highway/Mumbai-Pune Highway and Pule Nagar Akluj Road, via Bangalore-Mumbai Highway/Mumbai Highway/Mumbai-Pune Highway. There is one route from Pune to this temple, and it is via Phule Nagar Akluj Road. There are three routes from Ratnagiri to this temple, and they are via Umbraj-Chiplun Road, via NH166, and via Umbraj-Chiplun Road and Baramati Daund Road/Baramati Kashti Road. The closest airport to this temple is located in Aurangabad. The Aurangabad Airport is well connected to major cities in the country. There are several folklores associated to this sacred Lord Ganpati shrine. One such myth suggests that this temple is supposed to have been first constructed by Lord Vishnu which was then much later annihilated. Yet another legend states that a cowherd belonging to the Siddhatek region apparently envisioned a dream comprising of an old temple. It was on following his dream in reality that he found an idol of Lord Ganesha. It was this idol that was then worshipped by the cowherd soon followed by people living around this village, and which was then constructed into a temple during the 18th century by Ahilyabai Holkar, “The Philosopher Queen” of Indore belonging to the Holkar dynasty.